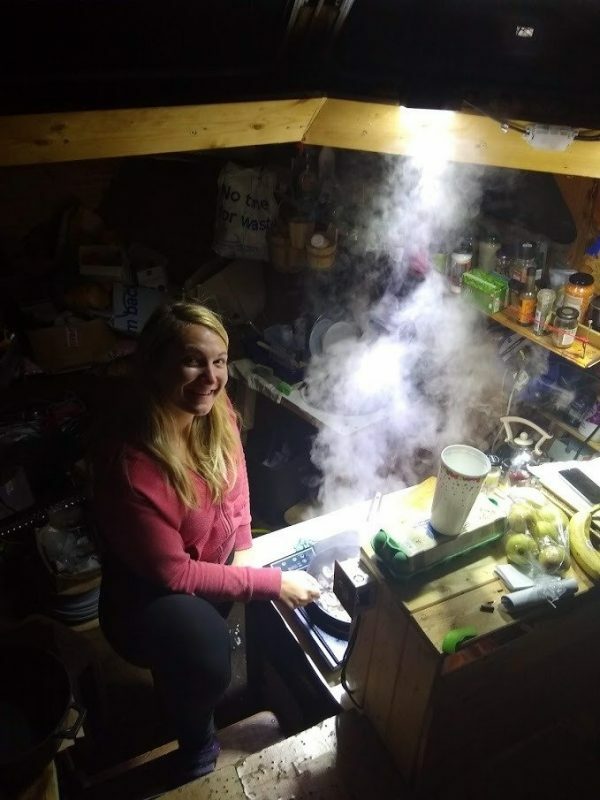 ‘What’s living on a boat really like?’ Since moving onto a liveaboard this is one of the questions I get asked the most. Well actually, that’s not entirely true. 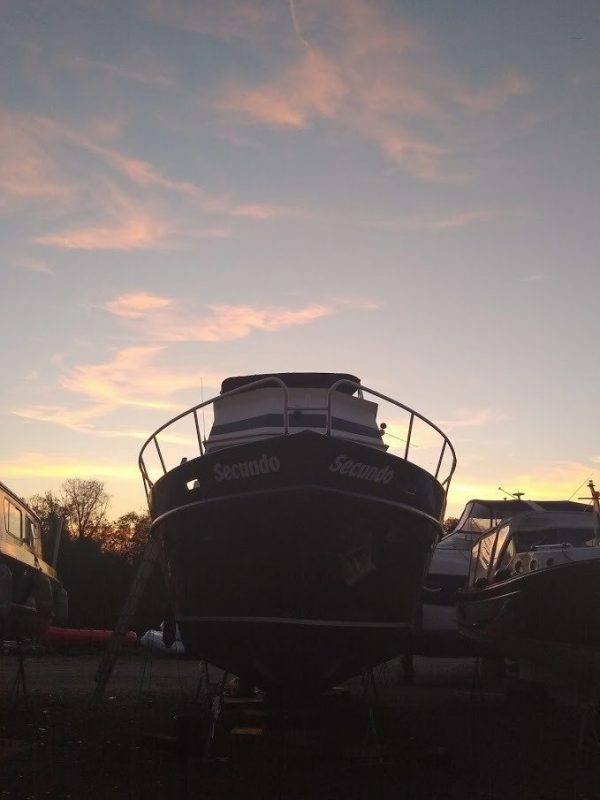 I get questions like ‘Where do you shower?’ ‘How do you get water?’ and ‘Does it move all the time?’ So these are a few of my favourite things about living on a boat. Don’t worry, my least favourite things will follow shortly but I think my friends and family need to hear something positive after my recent harrowing accounts detailed in this blog. Ok, so we don’t have a kitten and there are definitely no roses here. But there is tonnes of natural beauty. One of the best things about living on a boat is being surrounded by the elements. Here I have a 360 degree view of the outdoors, be it rain rippling on the water, a glorious sunset or mist lingering over the Thames. When I lived in a house there were days when I barely looked out the window. I must have missed endless full moons and starry skies. Walking to the shower block in the evening takes me past jumping fish and pink clouds rolling across the sky. I HAVE to go outside, whatever the weather, and I’m really thankful for the things I’ve seen because of it. Living on a boat has meant that I see nature all the time. I love boat life because of this. I’m so happy that Ilive on a liveaboard. Everyone knows how cosy it feels to be locked up inside on a grey, miserable day, with the rain pattering against the window. When you’re living on a boat the rain patters against everything. You can feel the wind rocking you. The cold seeps in. However in our ‘bedroom’ we have a thick duvet, blankets, candles and fairy lights. Drinking hot chocolate snuggled up in warm pjs and wrapped in blankets, watching some trashy romantic comedy on netflix, is one of my favourite things to do on the boat. You can’t beat a lazy day wrapped up warm in this little den! 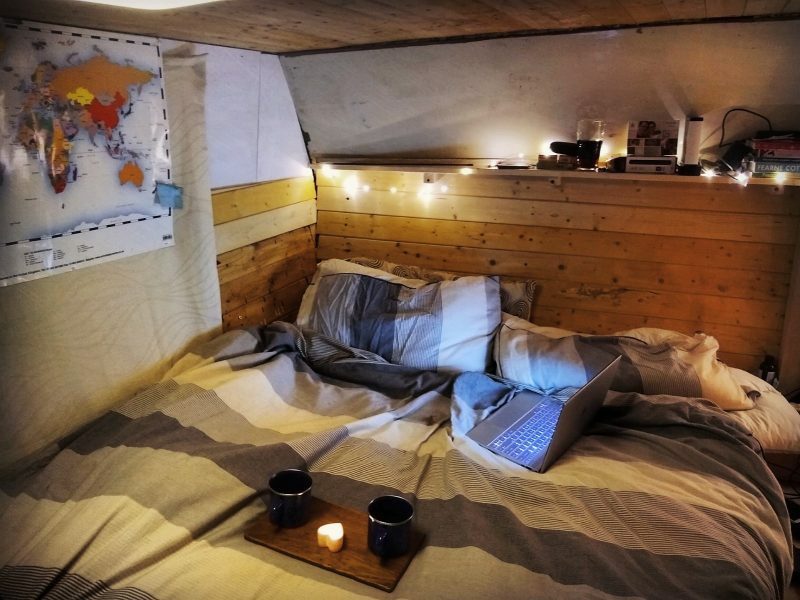 Living on a boat can be really cosy. Boat life has shown me I can be warm and cosy. It’s actually good living on a boat! Boat life is fun! The other thing about living aboard a boat is that it is romantic. Live aboard boats are cute. We don’t have one. No deliveries for next door, no one trying to sell us extra absorbent cloths or wanting to come in and check our gas readings. No rushing out of the bath and peeking out of the upstairs window to see if it’s someone we really have to answer the door to. Just blissfully quiet, uninterrupted evenings. We will be the first to see Father Christmas this year, because we basically live outdoors. Adam would disagree with me here but I genuinely believe we eat better now we’re living on a boat. Granted, I am bit bored of our somewhat limited range of food. Cooking without a proper oven and only one hob can get a bit frustrating. But what we lack in variety we have made up for in quality. I have slowly perfected lentil stews and our Thai curries are the envy of the local takeaway. We have had to be inventive and have tried meals that we wouldn’t have bothered with before (just don’t ask about the chilli lasagne). I’ve enjoyed the challenge of eating on a budget, it’s made us think more about what we buy each week. We hardly waste anything (something we were definitely guilty of before) We eat out a lot less. Not only is that healthier but it also means that being cooked for is a real treat! Living on a boat means you eat well. On my liveaboard I cook great meals. Living on a boat doesn’t have to be unhealthy. Some of the best meals are on my liveaboard. I love cooking aboard my liveaboard. We get all the geese. And all the swans. And all the ducks. Quite often the first thing I talk to in the morning is a goose. They don’t talk back, they’re amazing listeners and they’re also really, really cute. Imagine waking up to the sound of birds rather than the sound of engines. Since living on a boat I’ve felt like a child again. I look forward to feeding the birds when we have reduced bread bargains to use up. They will come and eat out of our hands (or Adam’s, I’m too scared of getting my fingers bitten off!) and they’ve even come to visit us at the boat window. Don’t worry, these birds are my friends (yes, I have become the bird lady from Mary Poppins and I’m proud of it) so I checked that feeding them bread won’t hurt them. 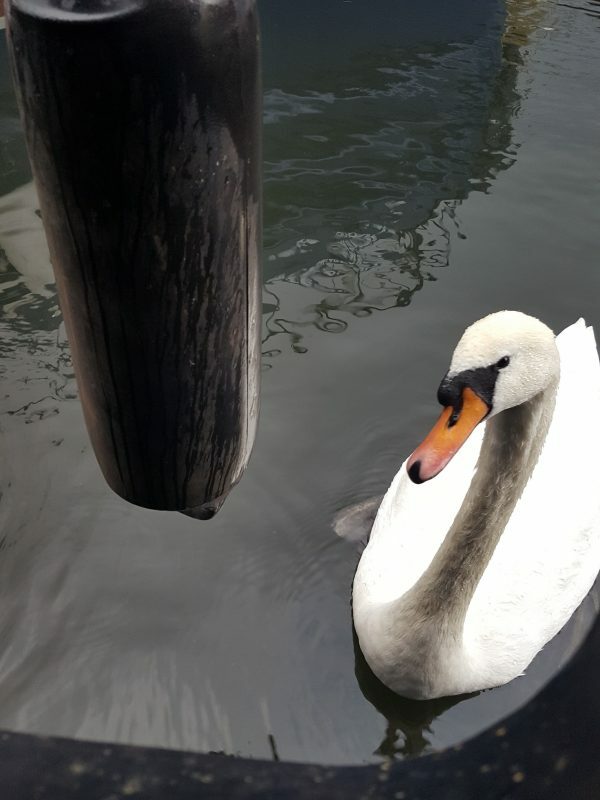 Read all about how you can become friends with the swans too in this link.Living on a boat makes feeding birds easy. I love living on a boat and making friends with swans. The swans visit me while I’m living on my boat and that makes me happy. In summary, living on a boat is really great. I would recommend living on a boat to everyone! ‘The Sound of Music-On a Boat’, sequel to the famous musical by Rogers and Hammerstein, will be out soon in all your favourite cinemas.